On August 21, the best total eclipse in 38 years will cross the entire U.S., turning hordes of everyday folks into amature astrononmers, or at least skygazers (see “Totally Eclipsed,” page 8). “I-25 northbound is likely to be a parking lot,” warns astronomer Dr. Douglas Duncan, 66, director of the Fiske Planetarium at the University of Colorado, who’s been chasing total eclipses since 1970. Duncan has dedicated his career to educating the public on the wonders of the sky. 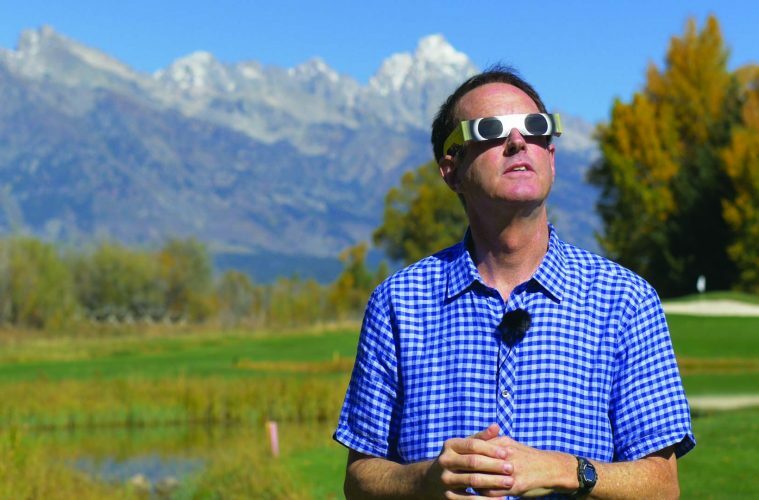 He’s a science commentator on Colorado Public Radio, has appeared on the History Channel and BBC Horizon, leads educational trips to eclipses, and helps fellow astronomers better communicate with the public. And he can’t wait for August. “A total eclipse is like the end of the world. There is a black hole in the sky where the sun should be. Pink flames of solar prominences and long silver streamers of the corona stretch across the sky. Total eclipses are also important scientifically. They let us see parts of the sun’s atmosphere that are otherwise invisible,” Duncan says. Even at 95 percent, however, eye protection is a must, and, failure to use appropriate filtration may result in permanent eye damage or blindness. That’s why Duncan is passionate about helping the entire country become equipped with safe $2 eclipse-watching glasses that are 1,000-times darker than sunglasses. Before the big day, he’s encouraging people to visit his eclipse-watch.com website to learn how to purchase them. Do it soon. During the 2012 eclipse, the Fiske Planetarium sold 20,000 pairs; McGuckin Hardware in Boulder sold 10,000 pairs. And get for ready things to get really weird.